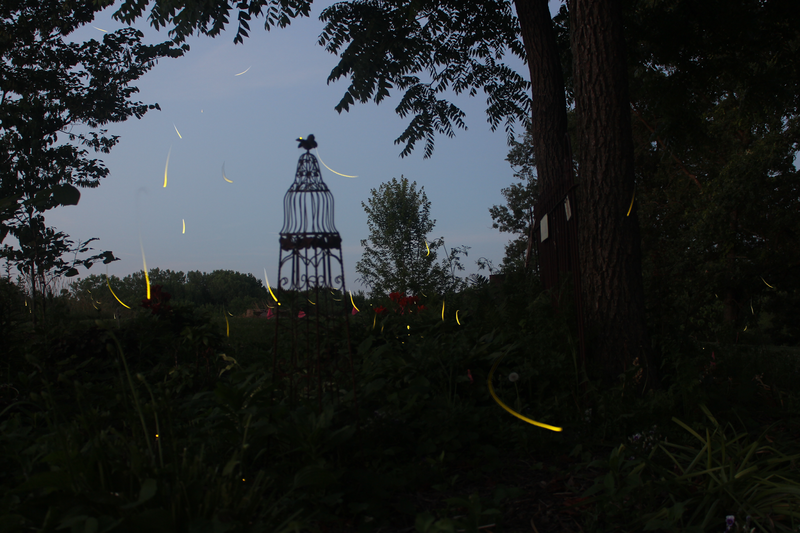 Growing up in the Midwest brings many specific experiences along with it, but one of the best is summer twilight lightning bug displays. I've always loved watching them and catching them. I've gone to a bioluminescent exhibit at the Chicago Field Museum and even after learning about them scientifically, I'm still convinced their butts are magical. I used to catch them and put them in a jar or bug catcher, and I loved releasing them back into the air. I always hoped they would all light up at the same time as they came out of the jar so it'd be like a firework show. But that never happened. I wanted desperately to be able to capture a little bit of that magic on film, but my rudimentary knowledge of cameras and shutterspeeds did not provide me with the necessary skills to do it. It became a goal. One day I'd be able to freeze those blinks. Until then I'd keep on enjoying the live show. This April we were out at my parent's house for a party and while heading out for a bonfire, I noticed little dots on the side of a hill glowing... 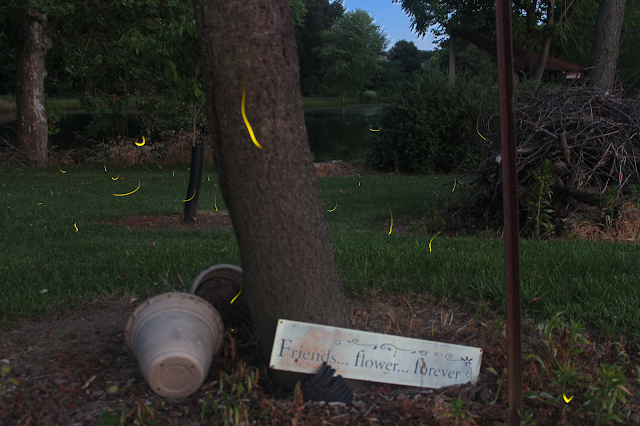 They were pre-lightning bugs in their glowing groundling stage. I knew they glowed on the ground thanks to the Field Museum exhibit, but I've never seen them before they were flying. They are a little creepy looking in that stage if you shine a light on them, but they're very sweet just glowing on the side of a hill. It took a few more weeks before we really started seeing them flying around the yard. A few weeks ago we had a ton in our back yard. More than I ever remember seeing the the past years we've lived here. I think this is in part due to the fact that we stopped mowing our backyard and the long, prairie-like grass is the perfect place for them to chill during the day. We have the perfect view from our bed through our giant window into our yard. We just laid there watching as they had a firefly festival about our woods. They danced as they displayed their different rhythms. Some wear long lights, and other blink in staccato. Sometimes there'd be an electric green amidst the warm yellows. We get excited when we see two flying at each other or doing a dance on the window pane, always hoping they find true love. 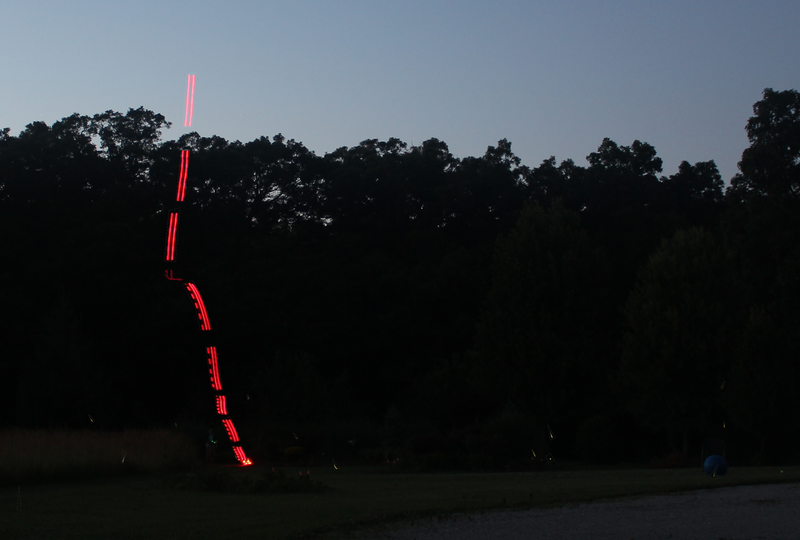 Watching them swoop and swoon in the dark is one of the best ways to drift off to sleep. My dad said that their yard was full of them too. We were heading up for the weekend so I decided to give the lightning bug photography another try. Last year we made a valiant attempt but didn't come away with much. This time I decided to pick a spot and use a tripod and take a LOT of pictures. I chose early twilight as they were first coming out for their nightly frolic, because I've noticed as they first come up from the grass they stay low and concentrated for a while before really taking flight into the night air. Picture after picture after picture. Capturing one to a few at a time. Sometimes none. I later put them over top of each other in post-production to get the shots you see below. It HAS occurred to me more than once that I could get the same basic picture by pulling out the yellow brush in Paint and making some dabs on the picture (because really that's what this looks like), but I did not stoop to that level. This is the real deal. These are not perfect images, and I think next time I will make sure to get at least one image that has the landscape more focused to be my base image, but the young me who couldn't find any pictures AT ALL is still proud to have captured something like this. Hazel is still too young to really be taken in by the dance of the blinking butts. She doesn't seem to notice them (and we are also usually trying to get her to sleep during prime time). I am already imagining a time when she is older, being able to spend evenings catching them with her. Perhaps the Hazelnaut will launch them into space as well, or ponder whether they are really fairies joyously covering the world in the cloak of night. These little creatures are some of the neatest on earth. In these days leading up to the 4th of July, I am looking forward to a good firework display, but while while I'm waiting I am appreciating the light spectacle that goes on every night all around me.